… or in most cases, how to un-Bell your phone line. I’m a fan of TekSavvy – and hence DSL for my Internet connection. 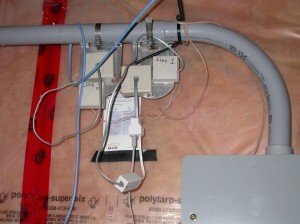 Poor internal phone wiring can affect the speed of your Internet, and since the CRTC ruled that Bell must provide higher connection speeds to independent ISPs, but isn’t, I really try to squeeze the best connection that I can out of my phone lines. Also, the Bell install is an eyesore, and looks shoddy at best. This isn’t the worst install that I’ve seen, by far, so hopefully someone else will find this information useful. You’ll notice the phone lines are hanging off of our power conduit from the street. Not cool. 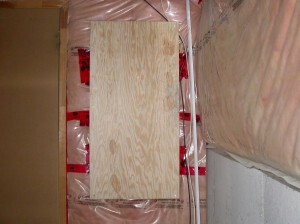 I installed a proper 3/4″ plywood panel that is anchored to the concrete (by a 2″x4″ frame) to use as the base for my re-installation. 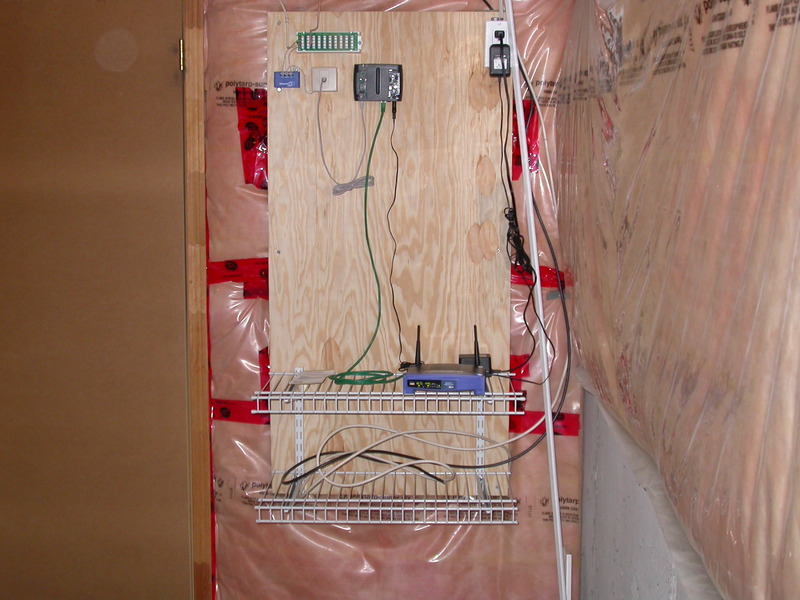 I’m also planning on running my CAT6a for the rest of my house back here, but that’s later on down the road. The first thing that was changed was the NID on the exterior of the house. It is the part that hooks my house’s wiring into Bell’s wiring. Originally I had a screw-post style NID. This style needs the insulation of the wire stripped back, and has the wire screwed down. Newer NIDs use insulation displacement connectors. This is a superior connection. My NID was replaced by the Bell technician. You’ll need to ask nicely for them to change it. From there, I replaced their telephone cable from the NID to the inside of the house with outdoor rated CAT5e, which should provide a cleaner signal. I noted which port in the NID the old pair was occupying. From there, I disconnected the old wire, and stripped back the outer jacket of the CAT5 by about an inch and a half. To prepare to pull the cable through, I twisted each available wire from the old line to a wire in my new CAT5 line, trimmed any left over cable, and then wrapped the joint in tuck tape. The tuck tape is thin, but man! that stuff has great tack. 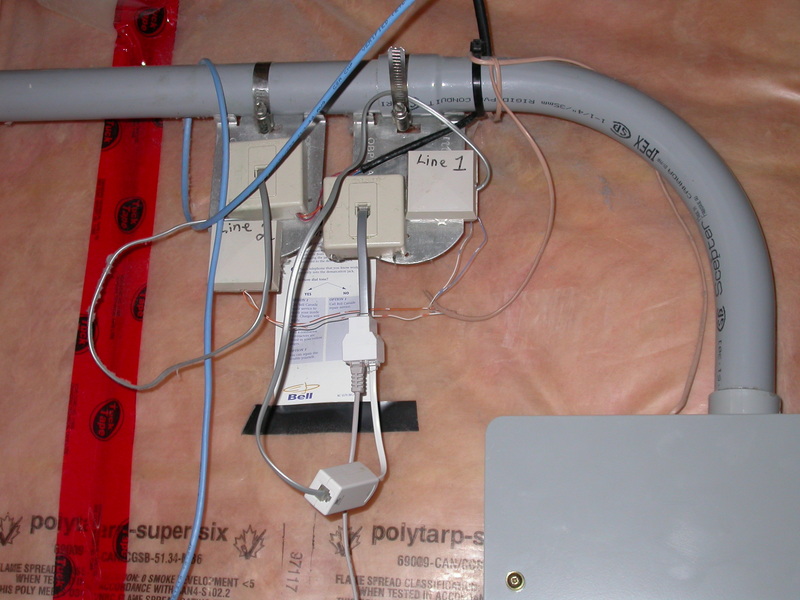 After that, it was simply a matter of feeding the CAT5 and the old line through all the exterior cable ties so it would pull through smoothly, and not get snagged. I pulled the cable mostly through the wall, and then reconnected the blue/white pair back to the previously occupied port in the NID, carefully fed the slack through the exterior cable ties, and then pulled it in the rest of the way to remove the slack. Once the cable was inside, I secured it to the floor joists in the basement ceiling with a cable stapler, being careful not to pinch the cable, and also avoiding running the cable parallel to power lines. I brought the cable over to my panel. Here is where the fun begins. I connected the blue/white pair (the one connected at the NID) to a Comtest NID-02. These are ADSL2+ certified filters that use IDCs, and as you can see from the picture, provide a very clean, and easy to understand install. The NID-02 has screw holes so you can mount it like I did. TekSavvy sells these, just ask them for a POTS splitter. I might have preferred Comtest’s CPE-01, because it has the modem jack built right in, allowing even fewer connections – but it has a screw terminal for the incoming/outgoing wires, and I think the IDC connector is a more clean install. From here, I connect to a dedicated jack for the modem – I borrowed Bell’s demarc :). This is a screw connector, but I’ll likely switch it over to a keystone. 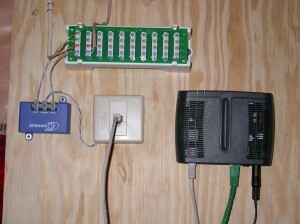 The house is connected to a Leviton IDC block. The block is wired as a bus, so I can add new runs without difficulty. It is a little overkill at this stage, but I won’t have to worry about it again. 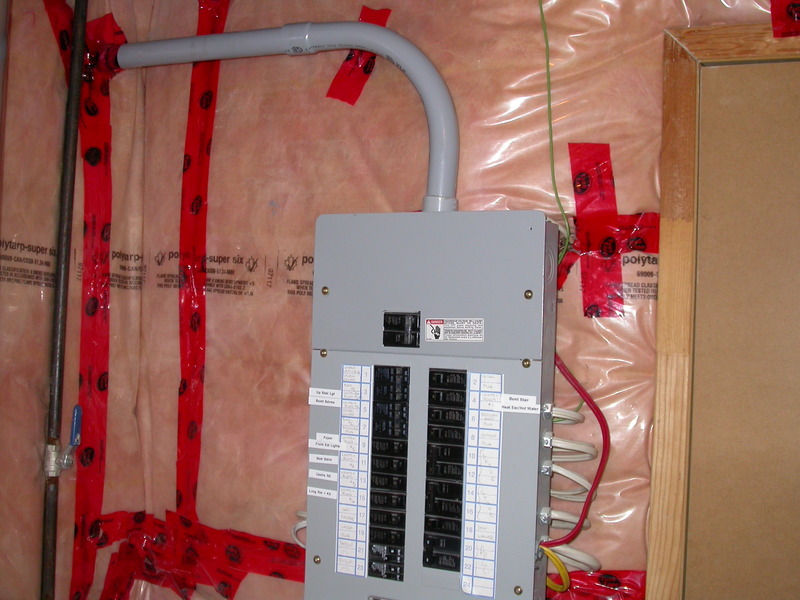 Adding new runs are as easy as punching them down in the next available spot on the block, and it will accommodate up to 4 lines (although most of the house is only wired for two). All in all, I’m pretty happy with the results. I know I’ve got the best DSL connection I can get now. I’ll be good for ADSL2+ when Bell finally capitulates to the CRTC order and allows independent ISPs to access the same speeds as Sympatico customers. Until we start building municipal fibre to the home, I will likely be using DSL technology. Thanks for this tutorial! This is exactly what I’m looking for. My ISP is teksavvy as well and I am trying maximize the potential of my service. Just a quick question for you. Where can I order a Keystone jack and the Levitron IDC block? I got the leviton IDC block from home depot. It’ll be with all their phone + cable stuff. They charge too much for it though. Same with the Keystone jacks, they have them there too. A better source is probably monoprice – they’ve got good prices on all this stuff. Just need to hunt around the site a little. Got r done… went from SNR 22dB down and 15 dB up to 27.5 dB down and 19 dB up. was at a 5/512 interlaced and now I can support 5/800 fast path. Thanks! Great post! This really inspired me to take a look at our old telephone wiring. 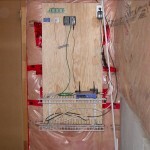 Everything is run on top of the electrical wiring… I ordered a dsl splitter yesterday and can’t wait to see the results. Don’t forget to let everyone know who was one of the guys who saw so much potential in you when you were first getting into technology back in your high school days and made some room in his service department for such young talent. 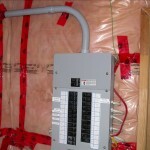 I smiled looking at the pictures of your installation; typical neat Derek :) Nice of you to share this with others. I left my addy behind, shoot me a quick E-mail when you get a chance just to say HI !!! My time working with Durham.Net, and Motor City Computers before that, was a great time to cut my teeth on computer diagnostics, networking, and most important for me today, software development, open source technologies, and ISP-level networking. Those were some great years, and I’m glad to have been a part of your companies! Definitely use a twisted pair cable. My gut would be just to do Cat5e. I’ve heard (unable to provide sources) that DSL is “tuned” for Cat3, but again… I’d be inclined to got Cat5e. Hi Derek, This was a very helpful post for me. I have a somewhat similar situation, but I don’t have your experience and knowledge. I found this post because I was searching for info on the CPE-01V which Bell installed some time ago. The line comes in from the NID and into the CPE-01V. There are two lines coming out of the CPE-01V, one from the phone connection and one from the modem connection and both head into the wall never to bee seen again. The mystery for me is that I don’t actually have a dedicated line to my modem. My modem is connected to a phone jack in my house. I want to move my modem and my plan was to install a dedicated line for my modem, but since the modem connection is already being used, I’m not sure what I should do. I’m assuming both the phone and modem wires are simple going to my jacks inside my house. Can I simply add a modem line to the RJ11 side of the CPE-01V? Or do I need to remove the existing wire from the modem connection and somehow connect it with the phone wire? Thank you in advance if you have time for an answer. FYI I don’t have much if any experience doing this kind of thing. It could be they wired the second line (black/yellow pair) on your internal wiring to the DSL side of the filter. Take a look at the wiring of the jack where your modem is plugged in, you should see the black/yellow pair of the house wiring connected to either the red/green pair of the jack, or the inside pair of the jack. To answer you question, I think you should be just fine to add a modem line to the RJ11 side of the CPE-01V. Try it, with the modem plugged directly in, and see what you get?